Your Jobs Overview page shows you all the Jobs that you have in your Studio Ninja account. Jobs are sorted in order of Job Date. By clicking on a Job, it will open up the Job Profile page with more information about this Job. Add new Jobs: Click the '+ Add' button to bring up the Add new Job lightbox. Search: Start typing in the search field and your list will dynamically start filters your search criteria. Filter: Display Active Jobs or Completed Jobs. 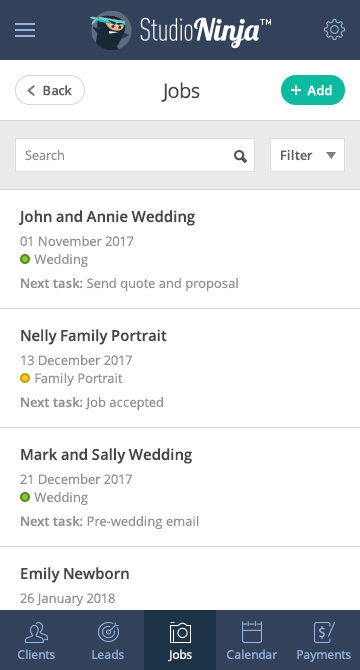 You can also see the name of the Job, the date of the shoot, what type of shoot it is and the next task that needs to be completed for this job. So, what's the difference between a new Job and a new Lead? Jobs: As soon as you create a new job it will automatically appear as Job Accepted in the workflow. The lead section of the workflow will be greyed out and unavailable, and the job is technically a confirmed job that is now booked in. Leads: A lead is a job the has not been accepted/confirmed yet. A Lead will convert into a Job automatically if a client accepts a quote, sign a contract, pays an invoice or if you manually tick the Job Accepted box. There are three main ways of adding Jobs into your Studio Ninja account. From the Job Overview page, click on + Add button to bring up the Add new job box and complete the new job details. From the Calendar, click on + Add button or on any date to bring up the Add new job box and complete the new job details. Convert a Lead into a Job. As soon as a lead accepts a quote, signs a contract, pays an invoices or if you tick Job Accepted in the workflow then a lead will automatically become a Job. The Job Profile page displays all the information about this specific job. Message us in-app by clicking on the green chat icon on the bottom right hand side and one of our friendly staff with give you a hand. Book a training session and Chris will help you through every step of the process to get you setup as quickly as possible. He can also answer any questions you may have and also make sure your account is running in the most efficient way. Join our Ninja community and chat with all of our users in the private (members only) Facebook Group.